The EU-IPFF and MEP Elena Gentile (S&D, IT) hosted an event to discuss the health-related achievements of the current legislative term and to look ahead to future political agendas. Brussels – 20 November 2018. The Group of Socialists & Democrats and the European Idiopathic Pulmonary Fibrosis Federation (EU-IPFF) hosted an event at the European Parliament on November 20, 2018. The event titled, “A forward-looking agenda for rare diseases: bringing Europe closer to its people”, reviewed what has been achieved on the topic of rare diseases in the past four years and what remains to be done. Against the backdrop of the current mandate of the European Parliament and European Commission drawing to a close, the event brought together stakeholders from across the health sector, as well as EU policymakers – notably MEP Elena Gentile (S&D Group, IT) who discussed the role of the European Parliament in keeping rare diseases at the top of the policy agenda. Annika Nowak, Member of the Cabinet of Commissioner for Health and Food Safety, Vytenis Andriukaitis, spoke about how the Commission will continue to ensure that rare diseases remain a political priority for the new legislature. In addition, Franz Schaefer, Chair of the ERNs Coordinators Group discussed how to scale-up successful initiatives within the European Reference Networks. Attendees at the event celebrated the achievements of the past few years, made possible by joining forces at a European level. These include the establishment of the European Reference Networks (ERNs) connecting highly-specialized European healthcare professionals working on rare diseases. However, it was also acknowledged that gaps remain within and across EU countries when it comes to delivering care and treatment for complex, chronic conditions such as Idiopathic Pulmonary Fibrosis (IPF). These have been identified within a new Benchmarking Report which was presented by the EU-IPFF during yesterday’s event, and is available at this link. The Report outlines the current state of IPF care and management in Europe, identifying best-performing countries along with challenges that demand greater political attention and an immediate response. It showed an alarming variation in access to specialised care across countries and it called for the implementation of existing guidelines to help standardise processes and address health inequalities. The Report also showed that greater awareness of IPF signs and symptoms among general practitioners is needed to address delays in diagnosis, to increase referral to specialist care and to improve timely access to treatment, which can slow disease progression. It also highlights that too many barriers exist in access to non-pharmacological treatment including lung transplantation, supplemental oxygen, pulmonary rehabilitation, and palliative care. However he also noted the need for future leaders to continue with the work and ensure rare diseases remain a political priority, adding “Current decision-makers can still have a word to say on rare diseases, and notably by securing sufficient funding for scientific research in order to abolish the “idiopathic” name from this disease”. While healthcare delivery remains a Member State competence, there is a role for the EU to play in sharing best practices and pooling resources, to benefit of all European IPF patients. The upcoming 2019-2024 European parliamentary term represents an opportunity for future EU leaders to promote radical policy change that can improve healthcare services and outcomes. A full report of the event is available at this link. To receive more information on the EU-IPFF activities, and notably on the Benchmarking Report, do not hesitate to contact the EU-IPFF Secretariat at secretariat@eu-ipff.org. The European Idiopathic Pulmonary Fibrosis and Related Disorders Federation (EU-IPFF) brings together 17 European national patient associations from twelve European countries. Its mission is to serve as the trusted resource for the IPF community by raising awareness, providing disease education, advancing care, and funding research. EU-IPFF collaborates with physicians, medical organisations, people with IPF, caregivers and policy-makers throughout Europe. For further information, please visit www.eu-ipff.org. IPF is a rare, long-term, progressive disease that affects the fragile tissue in the lungs. It leads to a gradual, persistent decline in lung function. IPF typically occurs in people over 45 years of age, and is more common in men than women. About 110,000 people in Europe live with IPF, and 35,000 new patients are diagnosed every year. The disease is irreversible and, without treatment, half of all patients will die within 2-5 years of diagnosis. FIMARP, the Italian Federation of support groups for patients with IPF is organizing the first Italian meeting on IPF and other rare respiratory diseases in Pistoia from September 22-23. This meeting will be an important occasion to bring together doctors, patients and all the relevant stakeholders involved in rare pulmonary diseases. It will be followed by a triangle tournament of football between Italian Transplanted Team, Italian National Transplanted Team and an all stars Italian team and a concert (Music 4 Breath) in memory of the first FIMARP President Alessandro Giordani. Other initiatives will take place in some Italian cities during IPF World Week 2018, including a spirometry day in Catania and in Padua. Additionally, as part of the Fitness 4 Breath initiative, a bike tour started on August 26: Achille Abbondanza, a 46 years old IPF patient will bike from Rome to Forli' (525km) in 1 week to raise awareness of IPF. Other IPF patients can also join his tour and he will stop in different cities to visit the local hospitals and the patients support groups. 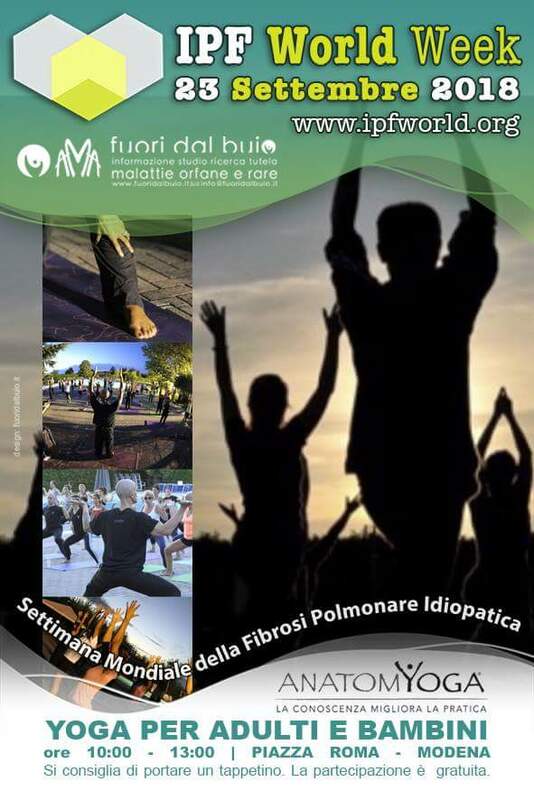 During IPF World Week 2018, the Italian support group for patients with IPF AMA FUORI DAL BUIO will organize a yoga session focusing on breathing together with AnatomYoga® . The session will take place on September 23 from 10:00am to 1:00pm in Modena (Italy). Yoga is beneficial for IPF patients as it can stimulate the lungs through focused breathing. In fact, basic breathing exercises may improve lung function and ease breathing problems. The Dutch Pulmonary Fibrosis Society in cooperation with 10 hospitals is organising 10 meetings in 10 different hospitals in the Netherlands during the IPF World Week 2018. During these meetings, patients, carers and healthcare professionals will learn more about pulmonary fibrosis. Different topics will be covered, among which: diagnosis, treatment, oxygen therapy and the impact of the disease in patients' daily lives. The Dutch Pulmonary Fibrosis Society will also take this opportunity to present its activities and to launch its new campaign: 'You don't have pulmonary fibrosis by yourself, talk about it!'. The aim of this campaign is to encourage patients living with pulmonary fibrosis to seek the support of their carers and to educate the carers on how to support their loved ones. Since the last meeting in 2016, there have been many exciting advances in the field of interstitial lung diseases (ILDs). The Ruhrlandklinik Essen hospital will present an extensive update on clinical and research developments in the field of idiopathic pulmonary fibrosis (IPF) and other ILDs. The 6th ILDs Colloquium will take place on 21 September 2018 at the Ruhrlandklinik (Essen, Germany), part of the University of Medicine of Essen. Francesco Bonella, chairman of the EU-IPFF Scientific Advisory Board is featured among the speakers. The full programme is available here. The Madrid headquarters of the Ramón Areces Foundation will host the 'International symposium on diagnosis and therapies in diseases with telomere shortening: dyskeratosis congenita and pulmonary fibrosis’. This meeting of experts, coordinated by María Molina, member of the EU-IPFF Scientific Advisory Board, among other coordinators, will place special emphasis on two of these rare diseases, dyskeratosis congenita and pulmonary fibrosis. In addition, Carlos Lines, President of the Spanish IPF Association (AFEFPI) and of the European IPF Federation (EU-IPFF), will highlight the importance of the associative movement to fight against the impact of these pathologies from a Spanish and a European perspectives. The full programme is available at this link.